As Workers Memorial Day approaches in the U.S. and the National Day of Mourning nears in Canada, we must redouble our efforts to enhance safety on the job and demand more respect for our work and our lives. It is the right of every worker to have a safe jobsite or workplace, but that right is increasingly neglected and under attack—with deadly consequences. Work-related fatalities in all industries are rising in the U.S. and Canada, with 6,095 deaths in 2016, the most recent statistics available. That is up from 5,688 the year before. Since 2008, 151 LIUNA members have been killed on the job and the construction industry accounts for one in five worker deaths. For too many men and women, going to work means risking their life to put food on the table for their families. 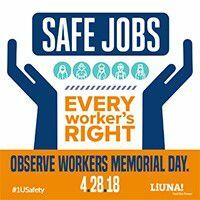 The fact is that one of the best safety programs a worker can have is a union like LIUNA, which helps contractors improve jobsite safety, trains workers to work more safely, and empowers workers, who as union members, can speak out against safety hazards. On this Workers Memorial Day and National Day of Mourning, let us solemnly commemorate the lives lost in building our countries. On April 28, let us honor those who have fallen or been maimed due to unsafe working conditions. Let’s spread the word about the need for safer jobsites by participating in events and sharing information with our co-workers, families and friends. And most importantly, let us continue to make LIUNA even stronger, so that the value of our lives is always recognized and so that the price of going to work is never death or injury on the job.